How to use rice flour in gluten free baking is one of the first challenges for anyone new to the gluten free diet. In the past I had no interest in knowing why wheat flour worked. I could successfully bake so I never thought too much about it. After several years of gluten free baking I can tell you that understanding a few basics about flour is very helpful for gluten free bakers. You might think (or hope) that you can simply buy a gluten free flour blend to replace wheat flour and bake all your old recipes. This is just not true. No single gluten free flour or starch behaves like wheat flour. Thus begins the journey of trial and error with gluten free baking. All flour contains protein, starch and fat…who knew! Flour is typically used to create structure in baked goods, to thicken sauces or as a coating for foods. 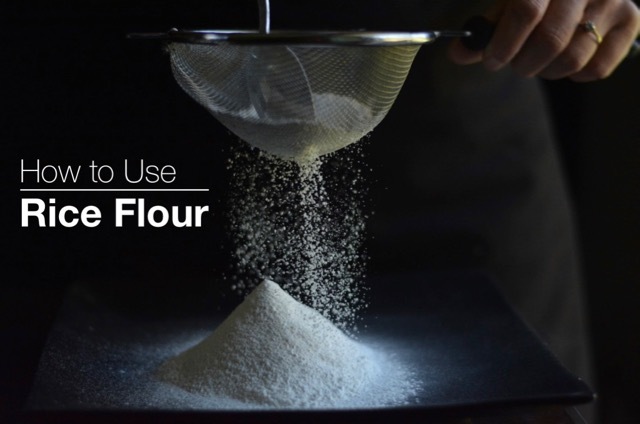 These processes rely on the different properties of flour and they are not all the same. White rice, brown rice and sweet rice flour are all commonly used in gluten free baking. The flour is made from rice so like white rice and brown rice, each flour is a little different. Here are two important things to know about rice flour. The milling process affects the texture of the flour and not all brands are the same. Finely milled rice flours are preferred. I buy Erawan brand white and sweet rice flours at my Asian grocery store and Bob’s Red Mill brown rice flour. America’s Test Kitchen (ATK) recommends all of Bob’s Red Mill brand of rice flours and I find them readily available. Store bought gluten free flour blends and the majority of gluten free baked goods contain rice flour. Since no single gluten free flour behaves like wheat flour using rice flour in combination with other starches and flours will yield the best results. If you have a store bought flour blend that works for you great. Just know that most blends will not give the best result in all recipes. I can make any muffin recipe and quick breads with my gluten free flour mix that contains sweet rice flour. However, for crisp cookies using some brown rice flour, potato starch and/or almond flour gives a better result. Americas Test Kitchen all purpose gluten free flour blend uses white and brown rice flour. Their two cookbooks, How Can It Be Gluten Free and How Can It Be Gluten Free Volume 2, are excellent resources for anyone wanting to understand what makes a recipe work. I now bake, and continue to experiment with both my homemade flour mix (that has sweet rice flour) as well as the ATK flour blend (that has white rice flour). Enjoying freshly baked goods at home is one of the joys of baking. You don’t need to bake every day or even every week but the ability to make cookies, cupcakes and the occasional birthday cake is a life skill worth learning. If you have kids in your life, whether they have celiac disease or not, be sure to involve them in the adventure. Start with that first successful recipe you like then make it over and over. That is how I have learned to bake gluten free. Gradually I learned how I could substitute one type of flour for another, or alter some ingredient to suit my taste. Sometimes I make a double batch of muffins but I don’t double the ingredients in one bowl. I simply make two recipes side by side using a different flour combination. I often do this with my basic recipe for banana muffins. I know how they should turn out so I can compare and adjust accordingly. Doing this will help you become more confident making substitutions, and that is an important skill for a gluten free baker. I use my homemade flour mix in some of my recipes but not all. I typically try a new recipe the way it is written then make adjustments from there. This table lists each recipe and shows which rice flour is used in it. There are no links in this table. Use the SEARCH magnifying glass in the top right hand corner from any page on this website to find what you are looking for. This is the first in a series of blog posts on gluten free flours. My intention is to provide a basic overview of several gluten free flours for the everyday home cook, both new and experienced. Let me know in the comments below if you have a baking story to share or a problem you are trying to solve.